Most of us have been there. You’re meeting your partners’ family and friends for the first time; you’re nervous, skeptical, even worried. Now toss in Bigfoot and you’ve got Dan Riesser and Andrew Genser’s “Stomping Ground.” Ben (John Bobeck) and Annie (Tarah DeSpain) leave Chicago to spend Thanksgiving in Annie’s old hometown, bringing their relationship up the next level. Quick to find out that his girlfriend might not be the person he thought he knew, “Big City” Ben learns of Annie’s drinking and partying ways and her love of Bigfoot hunting with Paul (Jeramy Blackford) and Jed (Justin Giddings). Immediate tension grows between Paul and Ben over Annie, and drunken plans turn into reality as the group loads up the next morning to take “Big City” onto his first Bigfoot hunt. You can learn a lot about a person by talking to the people they grew up with, and even more about yourself with how you handle it. “Stomping Ground” takes you on that awkward journey of insecurity when dealing with your partner’s past, your future, and, oh, did I mention a SASQUATCH?!? Co-writer and director Riesser takes a thriller and a rom-com and adds a splash of creature feature to make one of the more enjoyable Bigfoot stories I’ve seen in a while (“Harry and the Hendersons” and the “Jack Link’s” commercials are the only other ones on that list). The players and the pacing all play their parts fantastically against the gorgeous backdrop of the woods of North Carolina, and I love being so invested into the characters that I almost forget where the story is heading. 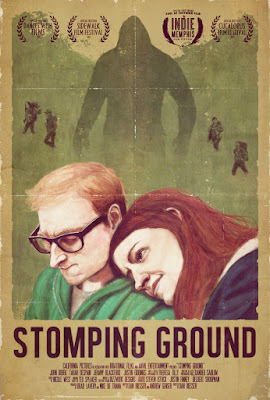 “Stomping Ground” is a love story built on the back of a smelly, furry, Bigfoot. Maybe it’s time to go on our own Sasquatch Safari. Out on DVD and VOD on March 8th!